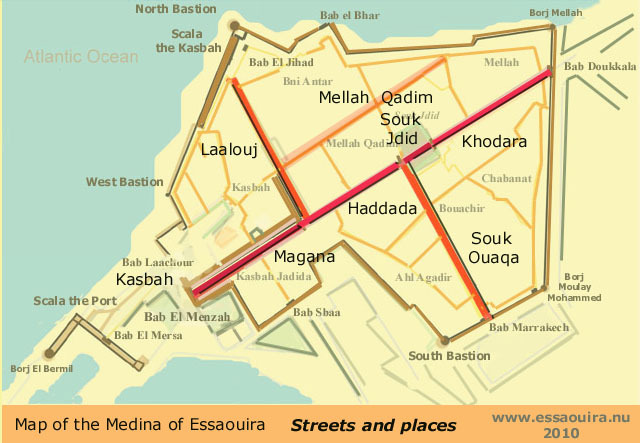 The main arthery of the medina begins in Bab Doukala in the North and reaches Bab El Menzah in the South. This Avenue has not only one name. It is divided into four parts with different names. Knowing the local names make it easier to find locations. Ahmed Al Alj - the architecte of the magnificent door of Scala the Port, Omar Al Alj - a brave soldier who heroically died in the bomardement of Essaouira by the French 1844 and Haïm Pinto - Saint Rabbi. douar = the term "douar" means "village [or] a group of rural dwellings" which includes 50 to 400 households, with a more dispersed habitat plain that montagne. 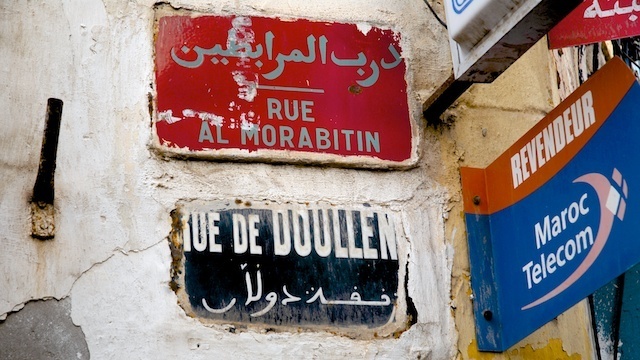 It is commonly the basic unit of the rural municipality but douars are not included in the official geographic coding and administrative service to another, and list the names of douars may change. caid Qadi is a judge ruling in accordance with the sharia, Islamic religious law appointed by the ruler of a Muslim country. Because Islam makes no distinction between religious and secular domains, qadis' traditionally have jurisdiction over all legal matters involving Muslims. The judgment of a qadi must be based on ijmah, the prevailing consensus of the ulema, Islamic scholars. A qadi must be an adult male. He must be a free man, a Muslim, sane, unconvicted of slander and educated in Islamic science. cheikh sheijk, shaykh, In Berber amghar, It is commonly used to designate an elder of a tribe, a revered wise man, or an Islamic scholar. Leader of the Jmaa. dar "house", '"structure", "place", "land" or "country". kasbah A kasbah (casbah, Qassabah,al-qasbah ) is a type of medina, Islamic city, or fortress (citadel). It was a place for the local leader to live and as a defense when the city was under attack. A kasbah has high walls which usually have no windows. Sometimes, they were built on the top of hill to make them easier to defend. Some of them were also placed near the entrance of harbors. koubba Koubba or Koubbèh (from Arabic koubba = dome, cupola). - Monument erected on the grave of a revered figure, or in a place where he stayed. The koubba, which occur mainly in North Africa, consisting of a cubic part surmounted by a spherical dome or arched, sometimes decorated with a crescent, and their size rarely exceeds 4 meters square, and some of them present in their interior a little room where you can find shelter. In colonial times, the French gave to these constructs the improper name of marabout. sultan Sultan is a title, with several historical meanings. Originally, it was an Arabic language abstract noun meaning "strength", "authority", or "rulership", meaning "authority" or "power". Later, it came to be used as the title of certain rulers who claimed almost full sovereignty in practical terms (i.e. the lack of dependence on any higher ruler), without claiming the overall caliphate, or it was used to refer to a powerful governor of a province within the caliphate. The dynasty and lands ruled by a sultan are referred to as a sultanate .